You’ll also be able to read a little more about how this recipe was selected for Betty’s Cook Nook plus learn about the photographer who took the picture of the 1970s Christmas family below. 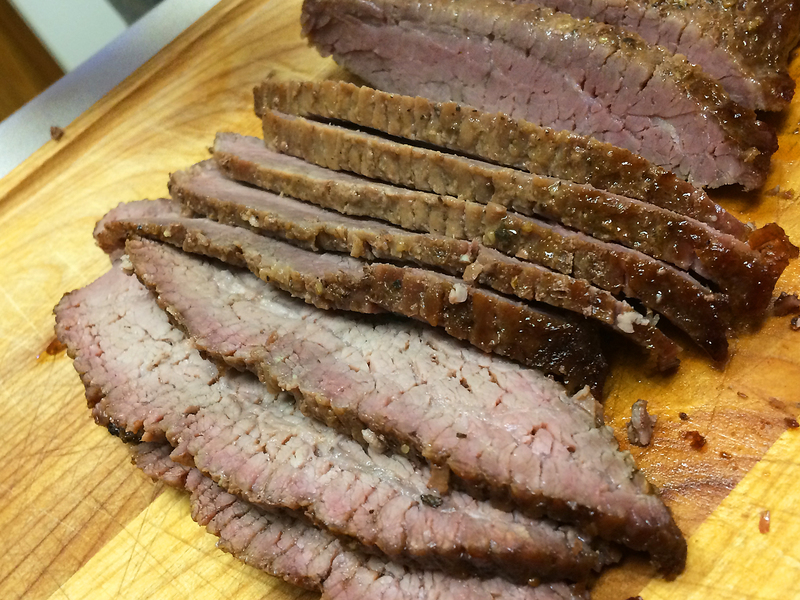 ♥ I was a little bummed when I started this recipe then discovered the meat needed to marinate overnight. Turns out it was well worth the wait. The flavor was delicious. I hope you agree! 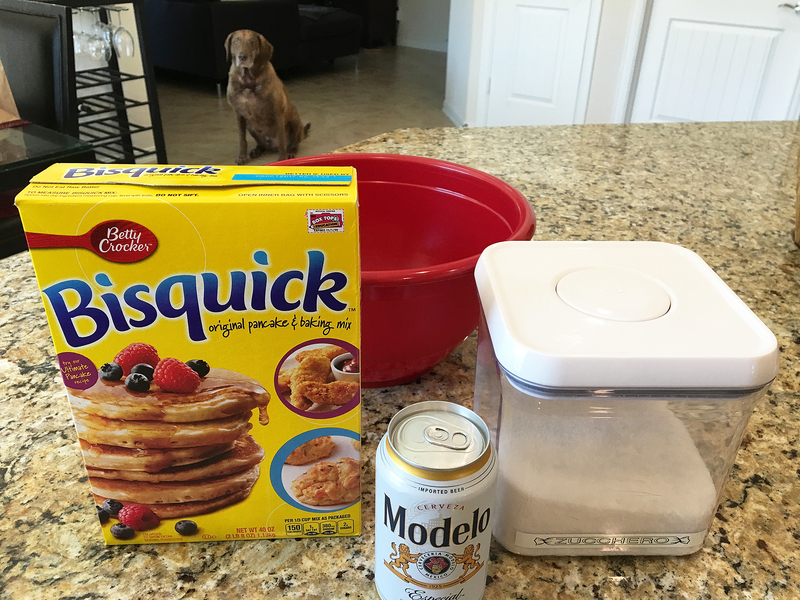 ♥ Any recipe where the first ingredient is beer is dyn-o-mite! 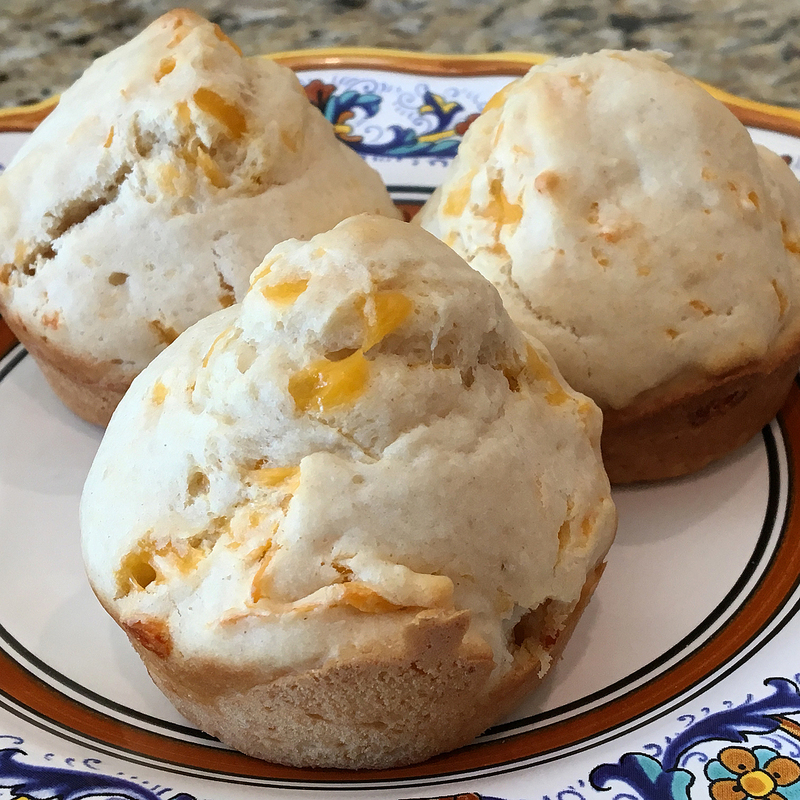 Add sour cream and you’re taking your tastebuds on a one way trip to Fantasy Island. ♥ I’m a Texan. So in the ingredient ranges noted below, I always round UP. ♥ The bread. At the store I was in a flurry and forgot to pick up some french bread. I used some thin sliced white I had loitering in the pantry and still loved this sandwich. Use your favorite sliced bread and you’ll be AOK. I promise. ♥ I prefer these sandwiches warm. If you follow the original recipe they are likely to be room temperature cool. Either way, you win. ♥ Some people cry over spilled milk. When I later realized I forgot to butter my bread I have to admit a few sniffles were born. 1. Place the steak in a shallow dish. Combine the first 5 ingredients above and pour this marinade over the steak. Cover and refrigerate overnight. 2. The next day … drain the steak and broil it 3 inches from the heat for 6 minutes on each side for medium rare in an electric oven (gas boiling tips here) or until its the desired degree of doneness. Slice across the grain in thin slices and set aside. Keep warm if you can. 3. Combine the butter, paprika and salt in a skillet. 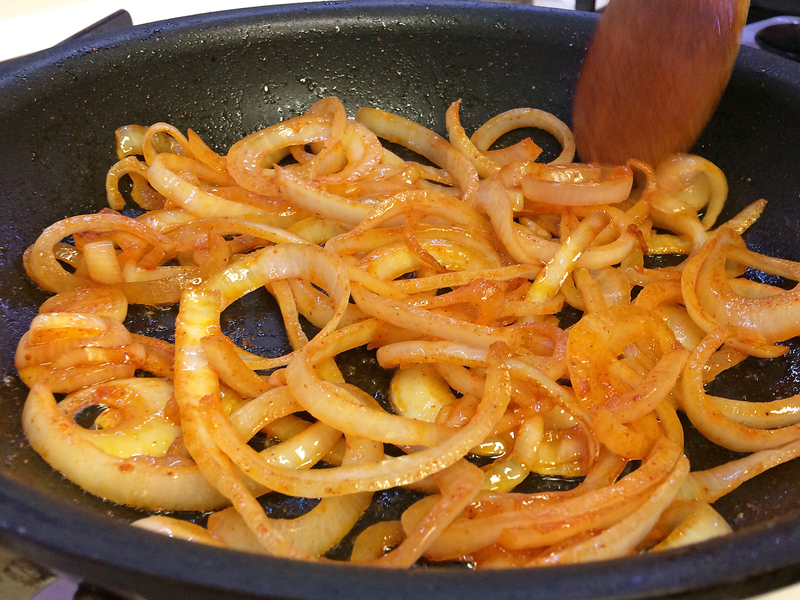 Add the onions and cook them until they are transparent then set aside. 4. Combine the sour cream and horseradish in a saucepan. Place over low heat, stirring until warm. 5. 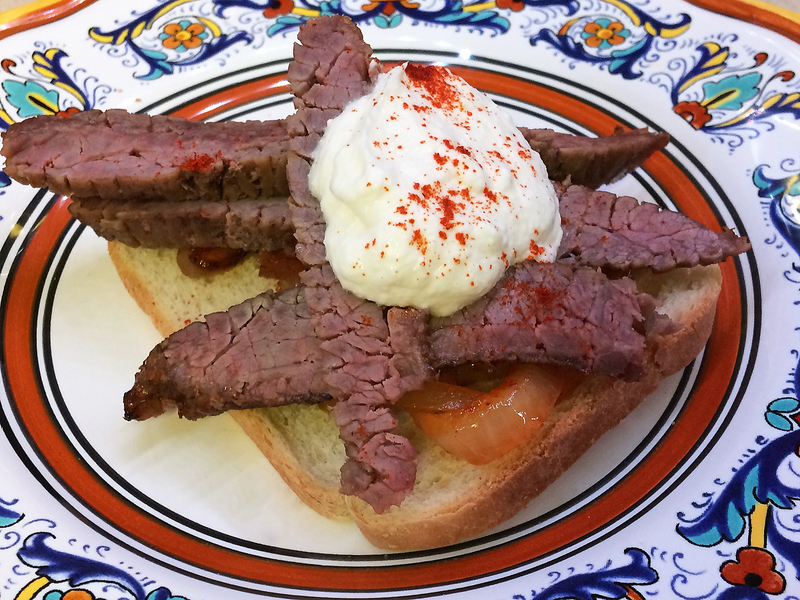 Place some onions on the buttered bread, top with a few steak slices then a dollop of your sour cream mixture. You can smear your dollop on top of your sandwich. I left mine a dollop for photo-taking purposes. 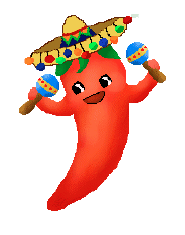 Add a dash more paprika on top and you’re ready to dive in! 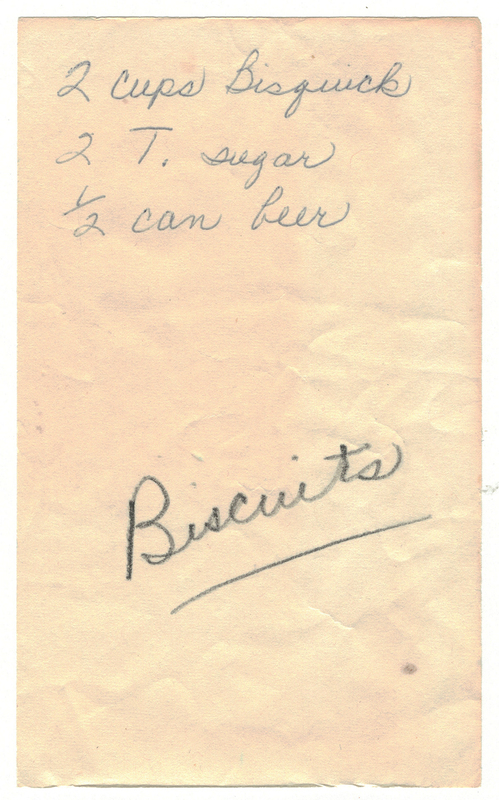 Here’s a scan of the original recipe! Note the missing Apple Cider recipe (how could they?!). 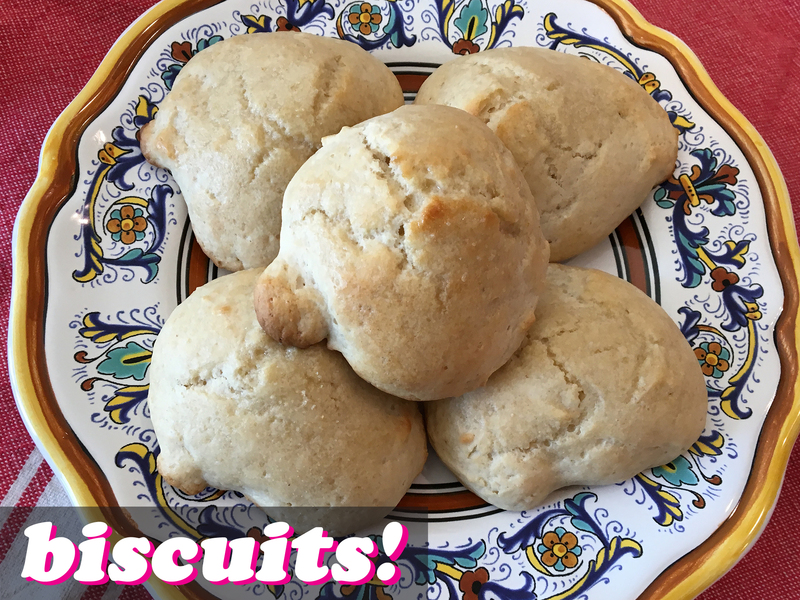 No worries – I have a substitute recipe coming soon. Dad was a Lone Star guy. Mom’s fav was Pearl Light. Whenever we’d go out for Tex-Mex (usually at El Nacho Grande or Teka Molino, mom would often order a Pearl Light and a side of chips and salsa. Before enjoying her beer, she’d drop a sliced lime or lemon into it and sprinkle in some salt to give it a fizzy kick. 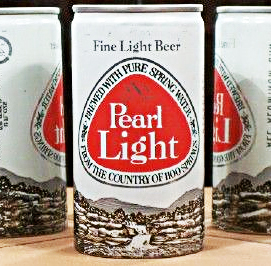 At home, she’d have Pearl Light canned and she’d follow suit, too. I also remember when mom was done eating, she’d salt a lemon wedge, chomp down and enjoy. Today, hearing of that would send my dentist (Dr. Borowski) into outer orbit. Whoopsie! Salt aside, grab your favorite beer and let’s make bread! 1. Blend ingredients on slow speed in a medium-sized bowl. 2. 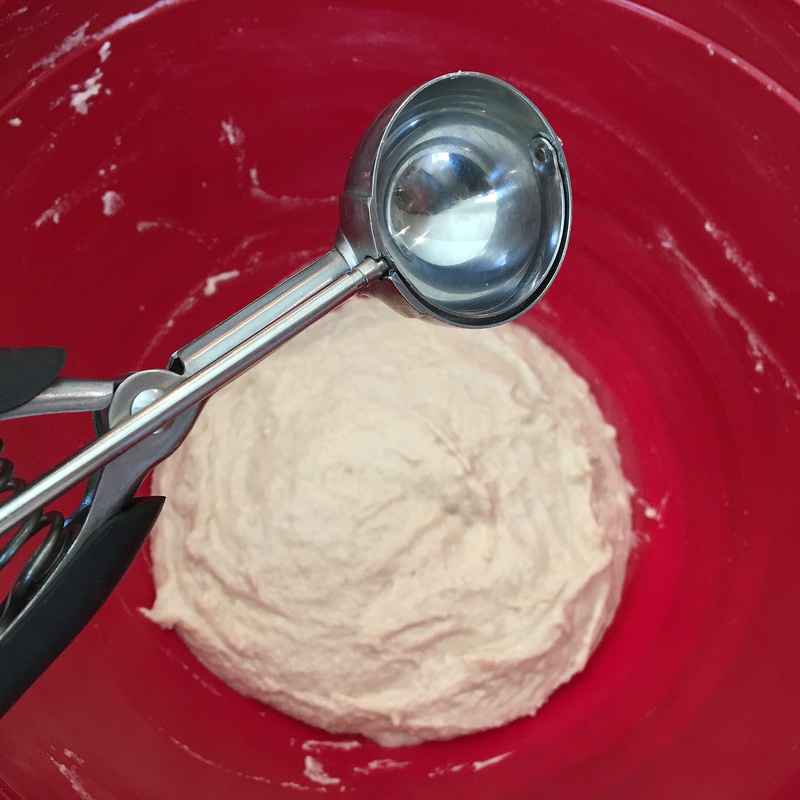 Transfer batter into a greased 9″ x 5″ pan. 3. Bake 45 minutes to an hour at 350°F. 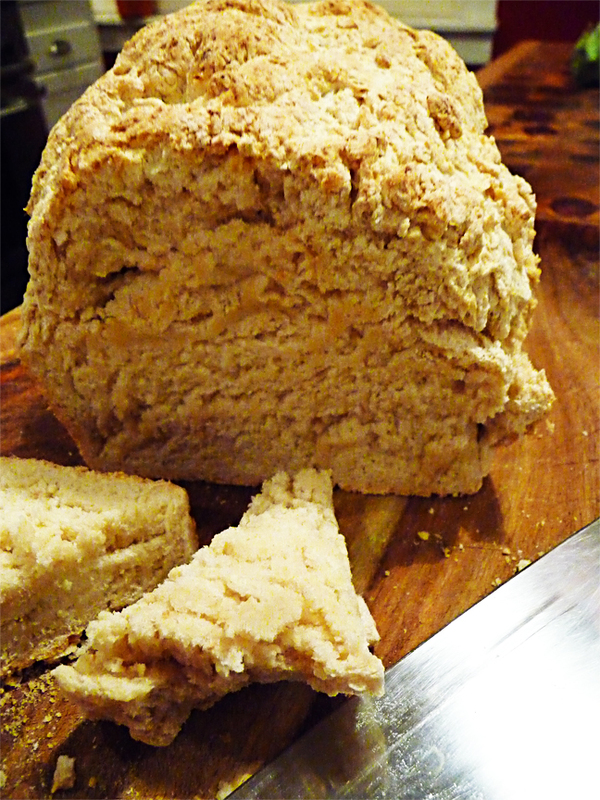 ♥ This bread is great with some butter on top. Remember, Nanny always called for Falfurrias brand butter. 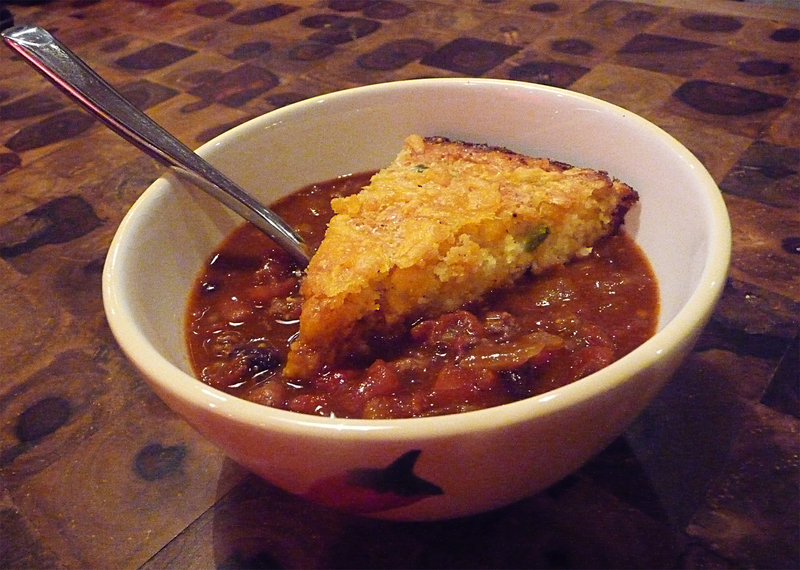 ♥ Don’t overcook the bread; keep it moist and soft. 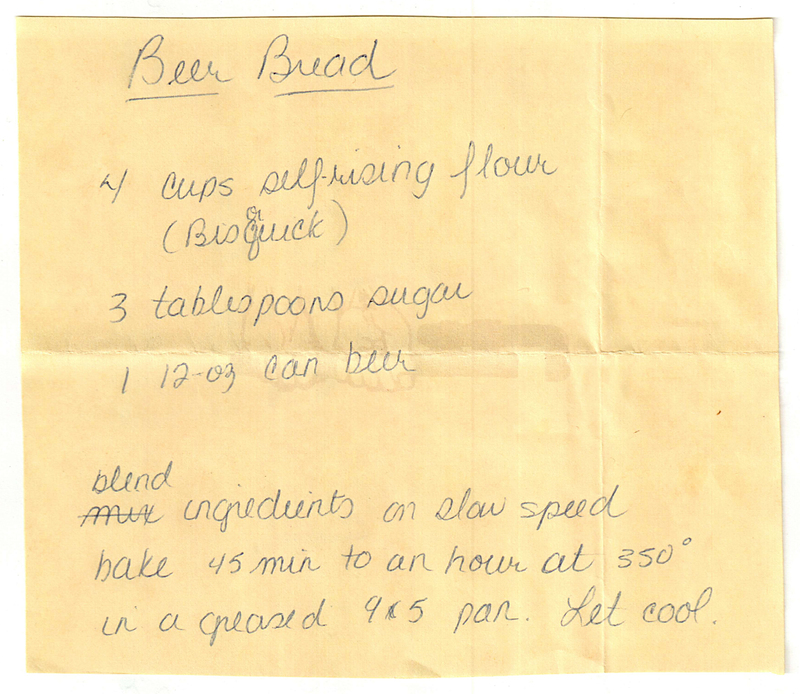 ♥ I don’t recognize the handwriting of the recipe below and it was definitely given to mom from a family friend. For some reason, I think it arrived to mom’s cookbook from the Swinny’s, our neighbors who lived a few doors down at 3006 Northridge Drive (Lela Swinny also gave mom this Gazpacho soup recipe, this egg nog recipe, and taught me how to make my breakfast-time favorite egg in a nest). 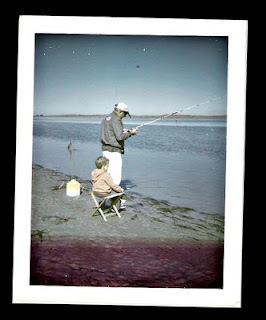 My Brother Tim’s love of the sea continues to this day… he even recently invested in a timeshare on the Texas Coast. Here’s a pic of me and Dad. And check out this one of Dad hypnotizing a crab!